June 2014 Archives - Do You Speak Gossip?Do You Speak Gossip? Usually at this time of the year, I think about swimsuits and summer dresses, but since I haven’t anything planned for this summer, let me just show you some of the models I sell on my shop, that I’d REALLY love to have in my closet. I had the pleasure to photograph all of the bags my friends had to sell, and I’m also incredibly happy to be allowed to take them out for a day (I take great care of them, don’t worry) and also take some outfit photos to show them in a better way. I’ve always been a sucker for anything Dolce & Gabbana and it’s almost killing me not being able to buy these babes. My favorite is the Miss Rouche one, followed closely by Miss Easy Way… And I still haven’t showed you my FAVORITE ones. But you’ll see them on the blog (and for sale on the shop) really soon. Which one is your favorite? June has come to an end and we’re officially in summer mood. Let’s hope that July will be filled with lots of dips in the sea, joy, laughter, good company etc. My June, apart from the outfits you see above (click here to see them all), had the re-launching of my shop, where we added some second-hand designer bags, and a few amazing events I attended. And let’s hope that these will just be the start of it…How was your June? Let me know in the comments, which is your favorite look of the month. We’ve already welcomed June, and this is the first post of the month, which means…. 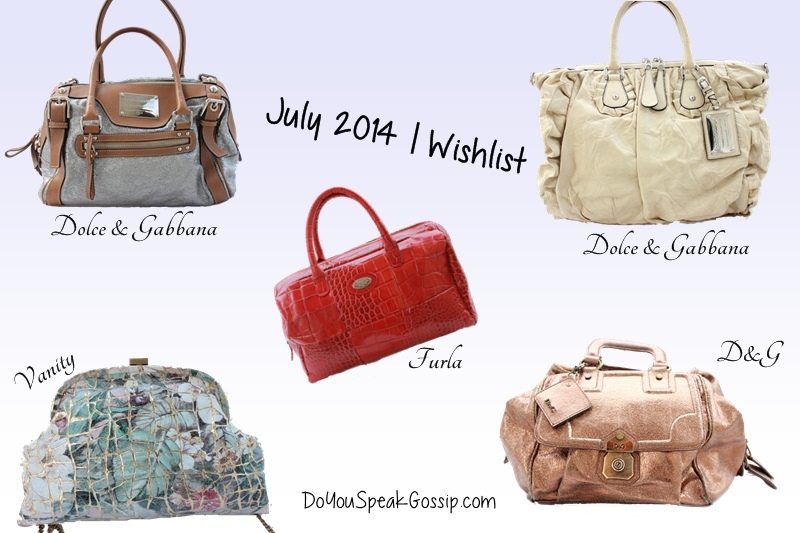 a new wishlist! Yes! This month I’m in love with skirts and dresses. Mostly midi ones, especially full skirts like the ones in the collage I’ve created. Some of them are already on their way to me. Guess which ones! I’ve noticed that during summer, skirts and dresses are all that I seem to wear. What do you usually wear during the summer months? Links and details on the widget at the end of the post.